A pic of the greatest butler ever. As a moderate fan of the television series (I'm more of a Regular Show guy), and a fan of action-RPG games- I figured I'd give this a go. It helps that I generally like Wayforward's games, even though most licensed games typically turn out for the worse- this one wasn't too bad. 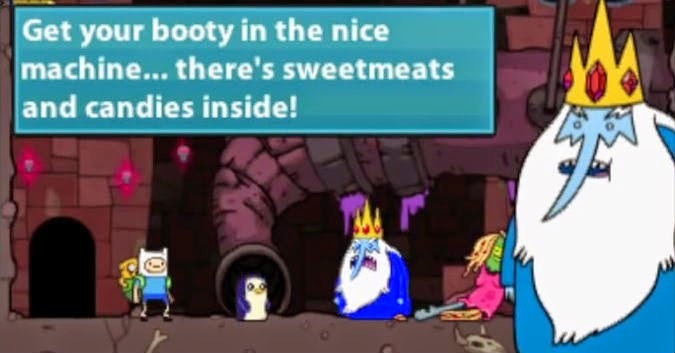 Much better than I thought Adventure Time: Explore the Dungeon Because I DON'T KNOW! was. Which also had a great concept, but fell short. The premise of the game is that Jake and Finn woke up to find one of the most helpful crimes committed. The Ice King has been accidentally eco-friendly in stealing all their garbage. What he does with it is ingenious as well. Instead of just letting him take their garbage they make it a mission to reclaim their disposable property and find that instead of rescuing princesses, they are rescuing facsimile princesses composed of trash. Hey Ice King! combines a top-down overworld with side-scrolling platforming for levels. Most friends and enemies are easily recognizable from fans of the show but don't offer much in the way of challenge in either battles or quests. The combat is the predictable range of small combos with Finn's fists or sword in addition to Jake's shape-shifting attacks and defenses that grow in number as you progress through the story. You collect items for use in your backpack/BMO lower screen of the DS system, which could've been a good thing, but since the squares are so small it becomes more of a hindrance during boss fights, or really- any of the grouped enemy encounters. There is a large range of places to visit spaced across the map, but unfortunately the Land of Ooo is severely underpopulated. The entire map feels mostly empty. Simple platforming and dull combat leaves players wanting to take the easiest route of just running past enemies. A majority of the people you run into are clumped into the city-zones with very little in-between. The dullness of this affair is what really hurts the game- it becomes a mindless repetitive chore to pass and re-pass the same few enemies in the same locations over and over and over. Even the most difficult boss in the game- the Ice King himself- is only really a problem because of a glitch. When he rises in the air and starts shooting projectiles if you happen to be anywhere on the left hand of the screen you instantly take damage as soon as he begins to shoot. The Penguin boss fight is the best. One of the major downsides is the title is almost longer than the game itself. I think it took me about 4 hours of casual play. Taking my sweet time didn't lengthen the game in any way, but really this isn't too much of a complaint- I've been enjoying the shorter games lately. It's what little variance there is here that is the problem. There just isn't enough real content. Only a few types of enemies, only a few sub-missions, and only a few locations to enter. The graphics are gorgeous and the animations are fluid- they are the best part of the game outside of the consistently hilarious dialogue. Sadly, these two things cannot save the game completely, although they make it much more tolerable. 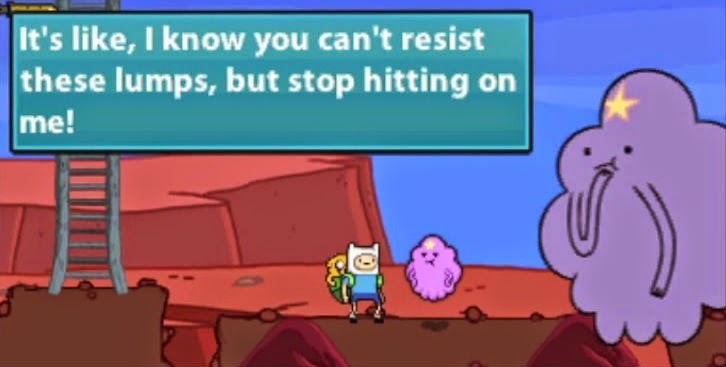 Adventure Time can always use more Lumpy Space Princess! Of course, my largest problem with this game is that there just wasn't enough Peppermint Butler. With that said, Hey Ice King! is really a good standard, sure it could use some more action, more locations, and stuff to do (maybe another few months of work could've filled in the gaps), but overall it is a decent game especially for the younger audiences. What this comes down to is if you are a fan, it'll be a good used purchase- a $10 eshop cost would make this feel much less hollow.